Recovery from Rotator cuff surgery can be a long, painful and stressful process. Early on in the recovery process our goal is to minimize the risk of re-injuring your shoulder or rotator cuff. That is the main reason why we restrict your activities for a long time after surgery. Once the surgery to repair a rotator cuff is completed, you need to ensure that you allow the rotator cuff to heal. To ensure a successful recovery after a rotator cuff repair often means paying close attention to the instructions you are given. Becoming too active, too soon can lead to a new tear or injury. A full recovery from rotator cuff surgery can take 6 months to one year. Rotator cuff tears are a very common source of shoulder pain. Surgery to repair the rotator cuff becomes an option if shoulder pain does not respond to non-surgical treatments. Surgery is often the first treatment discussed for large tears due to a severe shoulder injury. 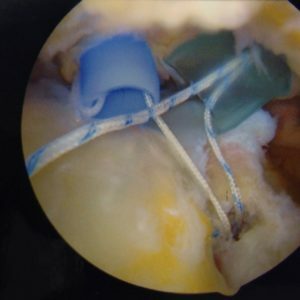 Is surgery necessary for a degenerative rotator cuff tear? Can Rotator Cuff Tendinosis Be Cured? Recovery from rotator cuff surgery is a lengthy process. Surgery on the shoulder to repair a rotator cuff tear usually produces significant pain and stiffness. Recovery from rotator cuff surgery is slow. This is because of the time it takes for the repaired rotator cuff tendon to heal back to the bone. You are in a sling and told not to use the arm. A sling is needed for up to 6 weeks to allow that healing process to begin. Not using the arm allows the repaired rotator cuff time to actually heal to the bone. The stiches we place are not strong enough to allow you to use the arm for normal activities until healing takes place. Being in a sling for a number of weeks will lead to stiffness and weakness. Not only is the stiffness a normal reaction, the stiffness in your shoulder might actually increase your chances of a better recovery after rotator cuff surgery. After the sling comes off, your activities are still limited to decrease the chance that your tear will come back again. When the sling is removed after a few weeks your rotator cuff repair is capable of lifting the weight of the arm. It is not strong enough to lift or carry objects or work overhead. That will take a few more months. There are many factors that have a role in your rotator cuff surgery recovery. Below are general guidelines… if you have questions, it’s better to ask your surgeon first before beginning any new activity. Patients who are recovering from rotator cuff surgery know all too well that surgery on the shoulder is often painful. Some patients have very little pain after shoulder surgery, but most have significant pain for a few days to a few weeks. Some tips that will assist you in preparation for rotator cuff surgery are as follows. First and foremost… listen to your surgeon’s instructions. For those of you who had a repair, this is particularly important. It is not unusual to see people in the office with no sling, despite clear instructions to remain in a sling and not to use the arm. Using your arm too soon after surgery will cause a new tear. Many of you report significant improvement in pain by using a cold compression sleeve on the shoulder. Having a sling which is comfortable and immobilizes the arm well is critical. Certain immobilizers which grasp the wrist tend to stay on better. I’ve heard every reason there is (I think) why you do not have the sling on. The rotator cuff is held to the bone by a few stitches. If you move the shoulder, there is a risk of causing failure of the repair. Some of you will try a compression sleeve to aid in your comfort. Some report that it is beneficial, while others do not. Sleeping can be an issue. Many have found a Shoulder Support Pillow/System helpful after a rotator cuff injury. Your surgeon will let you know when it is OK to start moving the shoulder. Many of you will have elbow pain from being in the sling. I personally allow my patients to stretch the elbow a few times a day, but you should check with your surgeon first to see if it’s OK. Pain at night, or being unable to sleep is a very common complaint when recovering from rotator cuff surgery. Sleeping in a recliner, or in a bed with many pillows behind you will help many of you to be able to sleep. Rolling up a small towel, or placing a small pillow behind your shoulder to hold your shoulder forward will also help you. Night pain can remain an issue for a few months following surgery. Not all rotator cuff surgeons are created equal. Volume matters, that means that the more rotator cuff surgeries your surgeon performs (within reason), the better the chance they will perform your surgery well. Find a surgeon who performs at least 75-100 rotator cuff repair surgeries a year. Don’t be afraid to ask. Performing the surgery properly and efficiently is the first step to achieving a good result. Stiffness is a common issue many patients have to deal with after rotator cuff surgery. Diabetic patients are even more prone to shoulder stiffness. Some patients have a genetic predisposition to developing stiffness. We may start you on a passive motion protocol with a physical therapist before the 6 week time frame, but that will depend on the type of tear you had, the type of repair you had and your surgeon’s preference. Aggressive motion too early during the recovery from rotator cuff surgery risks having the repair fail. Once your surgeon gives you the go ahead to move the arm, it is very important that you follow those instructions. A physical therapist will assist and guide you through the recovery process. If you are uncertain about whether or not you can move in a various direction or use the arm for certain activities ask your surgeon first! Recent scientific studies (Spring 2013) shows that nearly 3-5 months after rotator cuff surgery is when you are at greatest risk of re-injury or re-tearing your rotator cuff. This is probably the most critical period in the recovery from rotator cuff surgery. You can’t fight biology. It takes many months for a repaired rotator cuff to become strong enough to use it to lift weights, push or pull heavy objects. This is simply because of the biology of tendon healing! Many shoulder surgeons will not allow their patients to begin strength training for at least three months following rotator cuff surgery. A return to sports following a rotator cuff repair will not be possible for many months. This is meant to protect the rotator cuff as it continues to heal to the bone. Rotator cuff healing is a very long biological process. You will need to avoid contact sports, etc for nearly 6-12 months. Your recovery will depend on the size of your tear, quality of your tissue and the preferences of your surgeon. Again, check with your surgeon first. For most of you who are currently recovering from rotator cuff surgery, there is a light at the end of the tunnel. Many of you have heard from your friends that it will be a year before your shoulder feels “normal”. For some of you that will be true. For some of you, you will recover far faster.